Welcome to the home of the Hamilton Tiger-Cat Alumni. Our goal is to build membership and awareness of our Association and to recognize the rich history of football in Hamilton. It is an ever evolving interactive site for all Tiger-Cat fans to contribute and build through photos, comments and information. This site is a resource of the history of everything Tiger-Cat; from rosters to awards, profiles to statistics plus cards and collectibles. Check out our events page for where to meet some of your favourite alumni. All current and former CFL & Tiger-Cat players, coaches, management and staff are welcome to apply for membership. We have over 175 members and are continually recruiting. Visit our members’ page for more membership information. Our site is for fans and alumni, so be sure to participate. 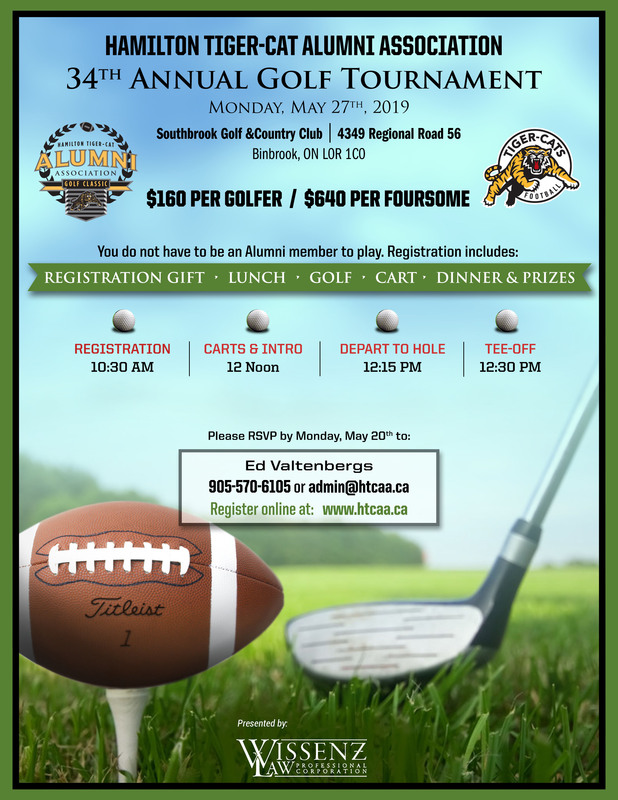 This years Hamilton Tiger-Cat Alumni tournament will be help on Monday, May 27th at Southbrook Golf & Country Club in Binbrook. This promises to be the biggest and best yet with likely our largest turn-out of Tiger-Cat Alumni! The “Sackmaster” was back in town as Joe Montford was the 23rd inductee into the Tiger-Cat Wall of Honour. In his 9 year career (8 as a Tiger-Cat), Joe amassed 135 sacks to go along with 35 forced fumbles and 18 recoveries, He was a 5-time CFL All-Star and 3-time CFL Most Outstanding Defensive Player. 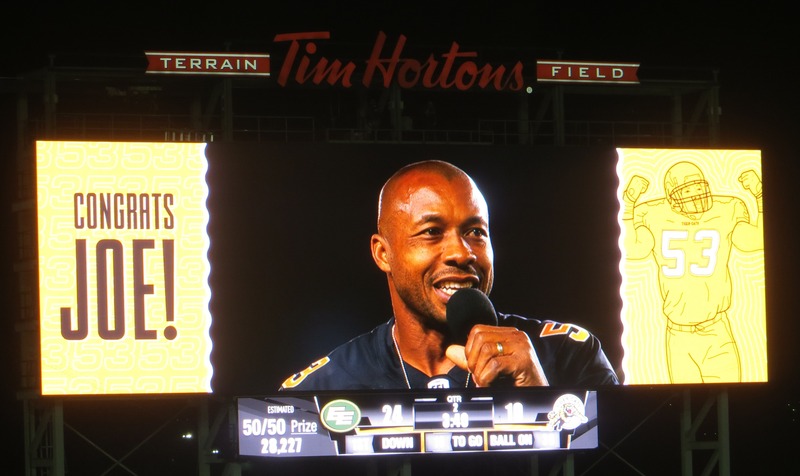 He was voted #40 of the Top 50 CFL players of all time and was inducted into the Hall of Fame in 2011. Former teammates Danny McManus, Mike Morreale and Rob Hitchcock were hand to help welcome him back on the field at half-time where he was also accompanied by many other Wall of Honour inductees. The Cats Claws hosted their Walk of Fame Induction Dinner on July 12th at Carmen’s. 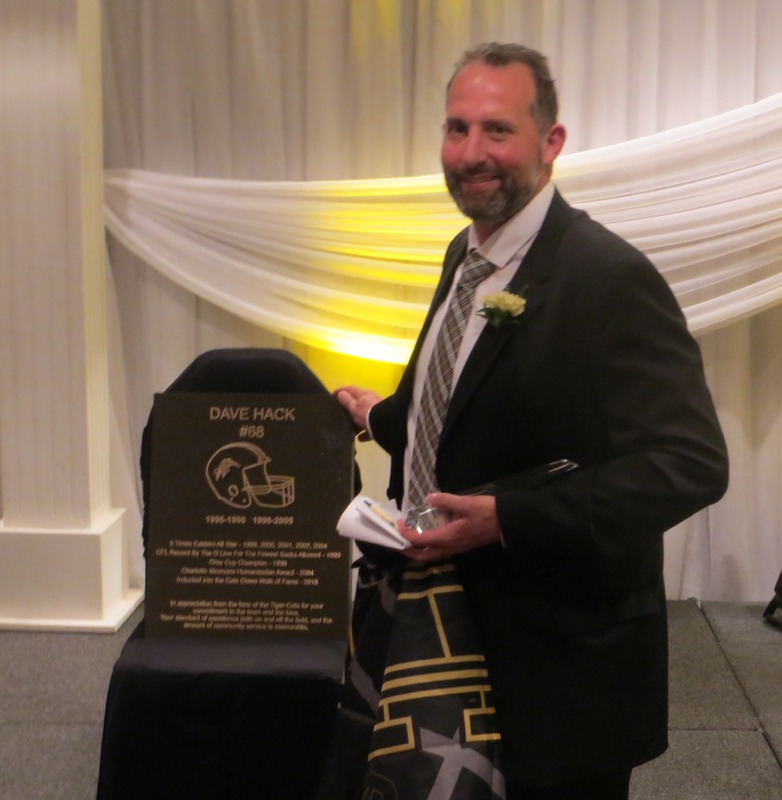 This year’s inductee was Dave Hack who played ten seasons Tiger-Cats. 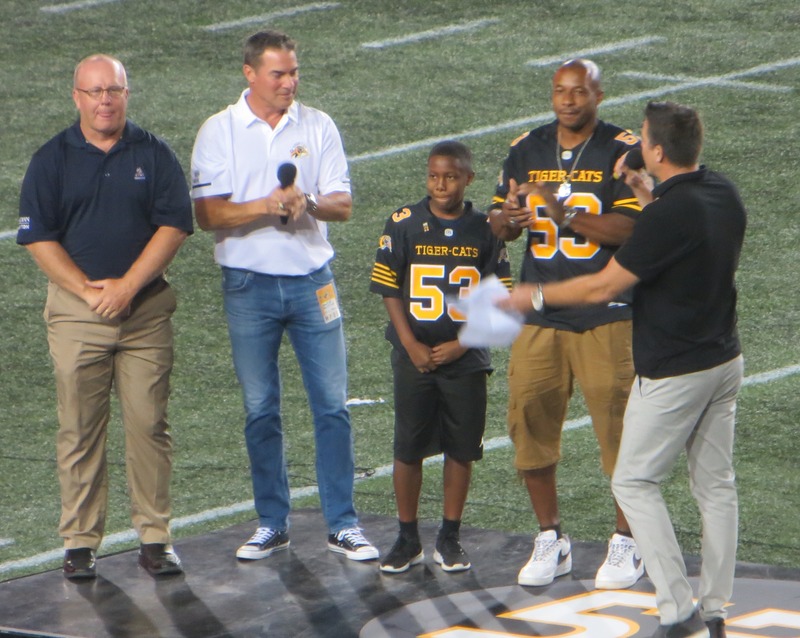 He was named Eastern All-Star five times and was a part of the Grey Cup Championship-winning Tiger-Cats in 1999. On hand were many fans and alumni who were entertained by “roaster” Paul Osbaldiston who told many amusing stories. 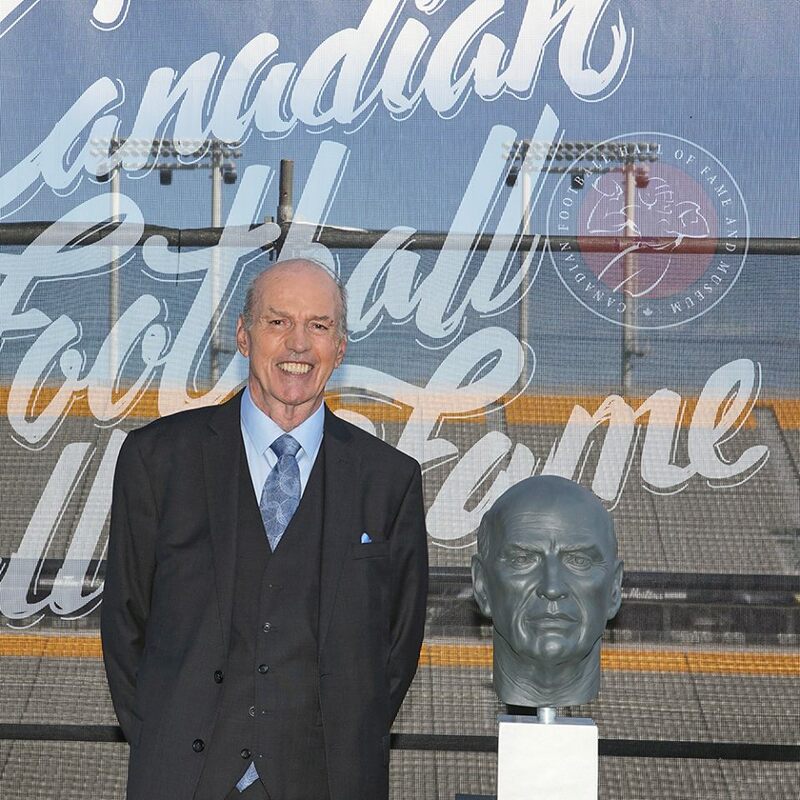 This year’s Hall of Fame Induction took place on the newly redesigned “Hall of Fame” level at Tim Horton’s Field. A specially erected elevated stage provided attendees with a close-up view of inductees with a spectacular back-drop of the stadium. Tiger-Cat Alumnus Frank Cosentino was inducted as a builder, and one of a total of seven new inductees. Frank played, coached, wrote and taught about the game, as a leading academic and Canadian football’s ‘professor emeritus’. He was drafted by the Hamilton Tiger-Cats first overall in the 1960 CFL Draft. During his 10-year CFL playing career, he helped Hamilton to five consecutive Grey Cup appearances, and Grey Cup victories in 1963 and 1965. Over two dozen alumni were on hand to take part in our annual golf tournament at Southbrook Golf & Country Club. A Fantastic turn-out along with great weather, food and prizes made this one of our most successful tournaments ever. Thanks to all that participated and especially to our sponsors. Mark your calendars for Monday, May 27th next year as we traditionally play the Monday following Victoria Day. 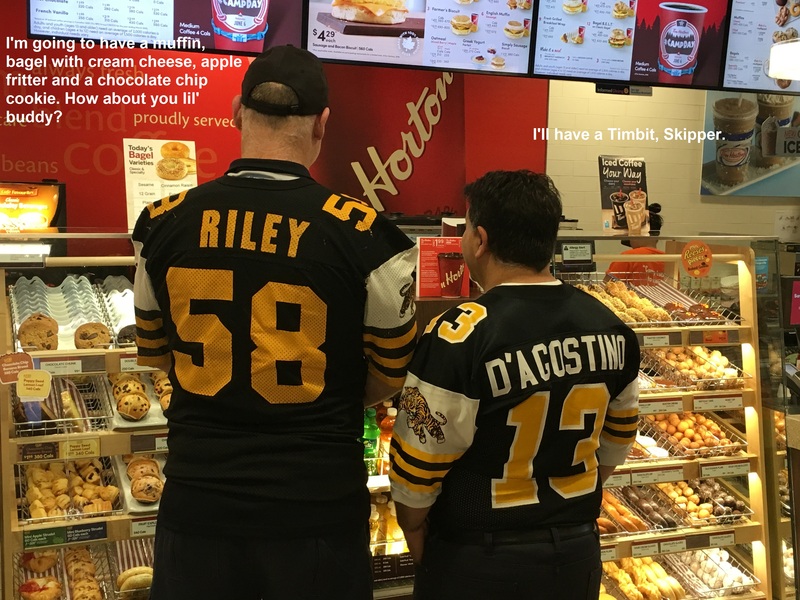 Tiger-Cat Alumni were once again out in force to assist in the Tim Horton’s Annual Fundraiser to help send kids to camp. Thanks to Tony D'Agostino, Mike Samples, Less Browne, Terry Lehne, Glenn Timlock, Rocky DiPietro, Mike McCarthy, Jim Papai, Bob Krouse, Ralph Scholz, Jason Riley and Ryan Donnelly. The Club helped organize a special event to raise funds in support of Alzheimer’s. Held at Macassa Lodge senior’s home on Upper Sherman, resident Angelo Mosca was joined by Less Browne, Jason Riley and Ryan Donnelly. 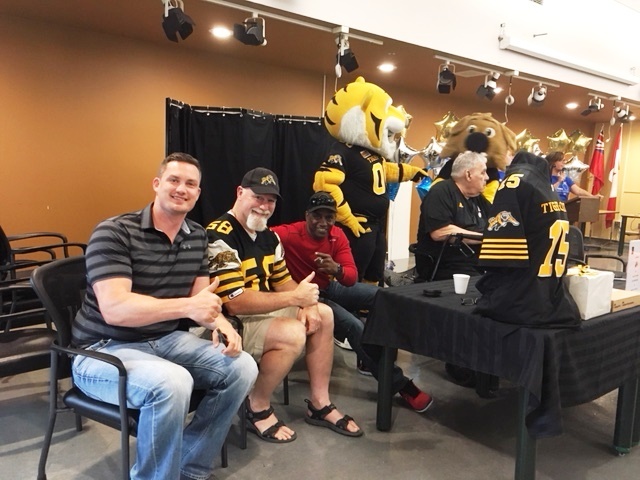 The community room was packed for a fun-filled afternoon that was also entertained by Tiger-Cat mascot “Stripes”. Thanks to Alumni member Ernie Caterini who secured a sponsor for Alumni to participate in this year’s annual C-Store Day hosted by the Canadian Convenience Store Association. 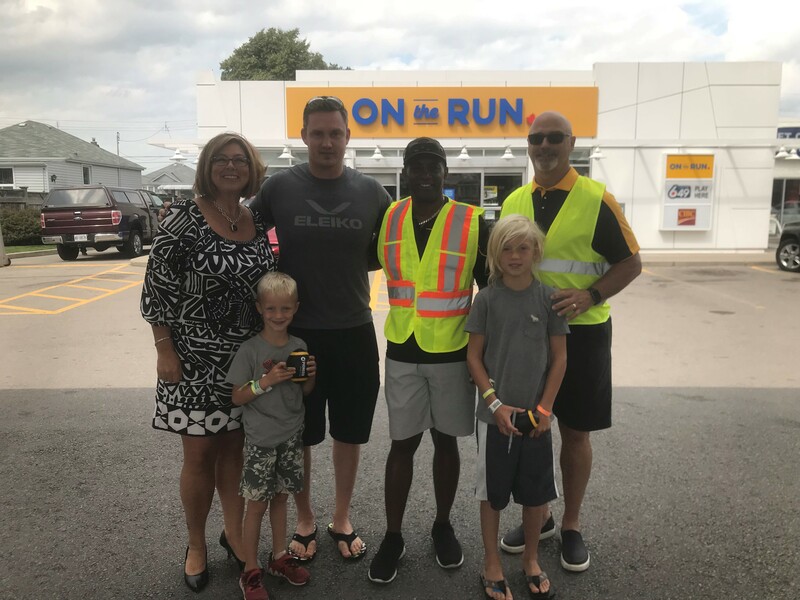 Alumni were on hand at the Pioneer Gas Bar & Store on Crockett St. to sign autographs and hand out footballs while encouraging customers to donate to the Children’s Wish Foundation. Thanks to Mike Samples, Mike McCarthy, Jason Riley, Hans Viergever, Steve Kearns, Less Browne, Derek Noble & Bob Richardson for helping out. 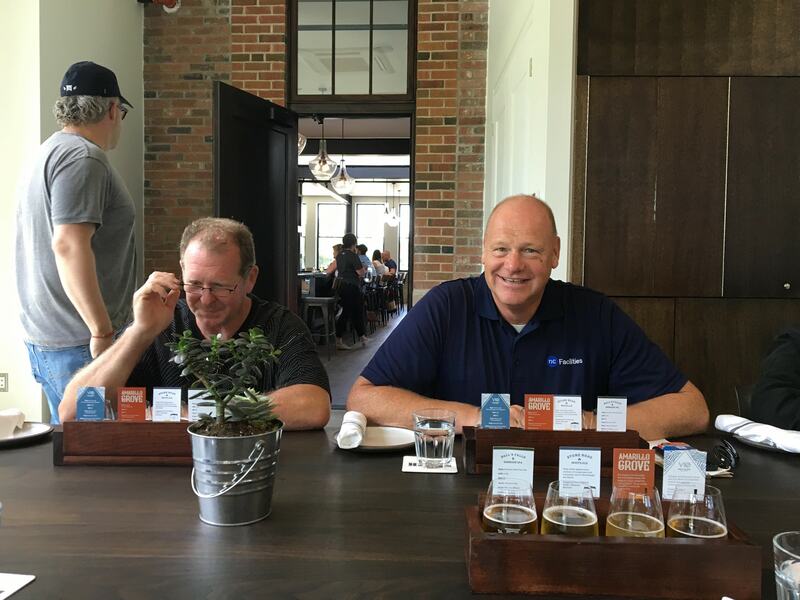 Some Niagara area Alumni were special guests for a luncheon hosted by CFLAA partner Bench Brewing in Beamsville. Performing quality control on product were Leo Ezerins, Brian Hutchings, Angelo Mosca, Darrel Harle, Ralph Scholz and chief inspector Terry Lehne. Alumni can now register or renew their membership online with Pay Pal. You can pay via credit card or through your bank account. Pay/Register here. We have created a new Tiger-Cat Alumni Facebook page for both alumni and fans to join and interact. The new page will be an extension of our website and allow us to better promote our events and activities as well as promote the history of the Club and hopefully engage more fans and alumni to participate. We encourage Alumni and fans to post news and pictures and engage in conversations. One of Hamilton's newest high schools will be named for Tiger-Cat Alumnus Bernie Custis, a local sports legend, long-time educator and the first black quarterback to play for a professional football team in North America. Custis's professional career began with the Tiger-Cats in August 1951. He was named an all-star in his first season before moving to running back and eventually winning the Grey Cup with the team in 1953. Custis went on to become a teacher and principal with the former Wentworth County Board of Education and a coach for the McMaster Marauders, where he spent eight seasons and was named Canadian university football's coach of the year in 1982. "Trustees are honoured to name the new north secondary school after Hamiltonian Bernie Custis, a leader, educator, and trail-blazer, whose achievements crossed borders and whose name will continue to inspire students for generations," said Todd White, chair of the board. The three-story school located across the street from Tim Horton’s Field will hold up to 1,250 students and includes a unique collaboration with the City of Hamilton that will offer "state-of-the-art physical education opportunities for students. It's set to open in September 2019. 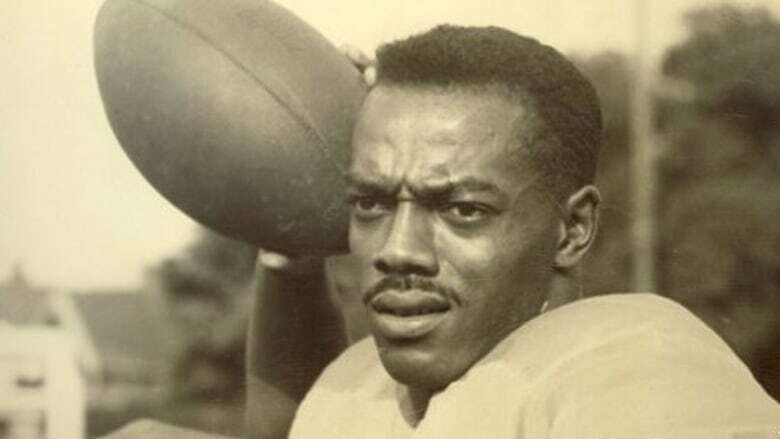 Bernie Custis died in 2017 at age 88. Dan Black, aka “Pigskin Pete” has retired from his role as official Tiger-Cat cheerleader. Citing personal reasons and a desire to spend and focus more time on family, Dan led his last “Oskee Wee Wee” on Labour Day this year. Dan has played the role of “Pigskin Pete” for the past 10 seasons. Dan also made numerous community appearances with and for the Tiger-Cat alumni and we thank him for his time and dedication to keeping the tradition alive. Don Sutherin was the latest Tiger-Cat alumnus to be inducted into the Hamilton Sports Hall of Fame. 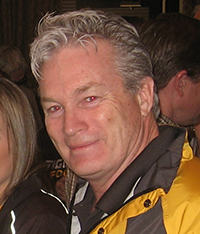 Don played 8 years with the Tiger-Cats as both DB and kicker. He was a 3-time CFL All-Star and 4-time Grey Cup Champion. He also was a Tiger-Cat coach for 8 years including four as head coach. Jesse Lumsden, one of, if not the greatest RB this community has ever produced has been inducted in the McMaster Athletics Hall of Fame. Tearing up school, conference and national record books over the course of four exceptional seasons as a Marauder, Lumsden’ s record of 4,138 career rushing yards eclipses the nearest Marauder by 1,498 despite his playing only four seasons. His 2004 tally of 21 touchdowns is an OUA record and ties the national mark, while his 1,816 yards that season broke both conference and national records. Jesse was drafted in the first round of the 2005 CFL Draft by the Hamilton Tiger-Cats. He played 4 spectacular but unfortunately injury marred seasons with the team which left fans amazed and wanting more to achieve his unrealized potential. A number of local senior Tiger-Cat alumni gather annually to recount football memories from day’s gone time. Getting together at the Village Restaurant were Steve Hmiel, Zeno Karcz, Pete Neumann, Nick Pollice, Ron Brewer, Willie Bethea, Tommy Joe Coffey and Bob Krouse. This past May, Shaw Communications Inc. and the Canadian Football League (CFL) announced that Shaw will donate $50,000 to three children’s charities selected by James Wilder Jr., Mike Reilly and Brandon Banks – the Shaw CFL Top Performers of the 2017 season. Hamilton Tiger-Cats receiver Brandon Banks had a career year in 2017, recording his first 1,000-yard season while scoring a career-high 11 touchdowns that led him to finish third in the Shaw CFL Top Performers leaderboard. Banks will contribute $10,000 to the David Lane Youth Success Fund at John Howard Society through Give Proof to Our Youth in Hamilton. David Lane who we lost suddenly in 2016 was a valued TigerTown Council member and friend of many in TigerTown. We are proud to have our players contributing to his legacy. GENE CEPPETELLI passed away on June 14th at the age of 78. JOHN HOHMAN passed away on August 2nd at the age of 75. HARRY LAMPMAN passed away on June 9th at the age of 87. JIM STYRES passed away on August 29th at the age of 88. ROGER YACHETTI passed away on September 16th at the age of 78. The Tiger-Cat Alumni are on a quest to collect "Team Memorabilia". We would like to display it on the web-site. 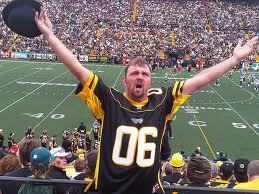 Currently we are looking for "Team Pictures" and "Grey Cup ticket stubs". We are are also looking to collect items that you may want to lend or donate to the Alumni Association to put on display in our "Alumni Clubhouse" inside Tim Horton's Field.